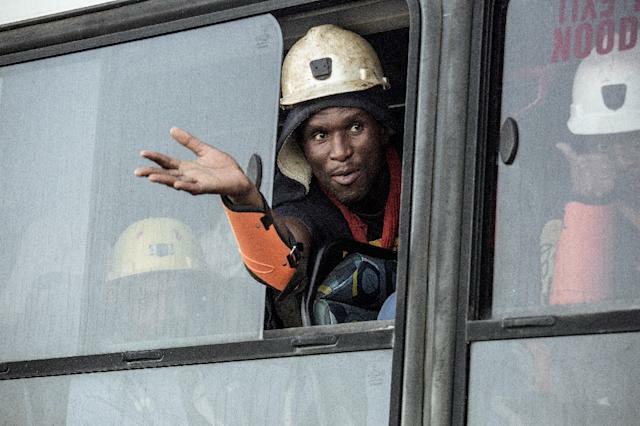 Theunissen (Afrique du Sud) (AFP) - All 955 gold miners who were trapped underground for more than a day in South Africa following a power cut resurfaced unharmed on Friday, the mine's owner Sibanye Gold said. "Everybody's out," mine spokesman James Wellsted told AFP, adding that there were "cases of dehydration and high blood pressure but nothing serious". After several hours engineers were able to restore power, allowing the hoist to bring up the miners -- who had been trapped since Wednesday evening -- in batches. Asked if there had been any casualties, Wellsted said there was "no indication so far that anyone has been in distress" although it had been a "traumatic experience". Several ambulances arrived on-site overnight, said AFP reporter at the scene. At sunrise the workers left by bus after undergoing medical check-ups. Nervous family members had earlier gathered along the road to the shaft, kept at a distance by security guards as they waited for news. The accident at Beatrix mine in Free State province, 290 kilometres (180 miles) southwest of Johannesburg, has reignited safety concerns at South African mines. The National Union of Mineworkers (NUM) has called on mineworkers to refuse to work in "dangerous conditions". "Major multinational corporations like Sibanye-Stillwater which should be industry leaders in creating a safety culture are doing far too little to prevent accidents," the union said in a statement overnight. A parliamentary committee on mining expressed outrage at the incident, calling for "drastic" action against the mining company. It blasted as "utterly unacceptable" that the mine had no backup plan to bring the workers to the surface. The country possesses rich mineral reserves and has some of the world's deepest gold mines. Gold was for many decades the backbone of South Africa's economy, but production has declined sharply due to depletion of reserves.